You know me well enough by now that I love my food, thinking about it, eating it and planning my next meal. Seriously I could spend a whole day dreaming about food. My next favourite pastime if not eating, is listening to someone else talking about food. 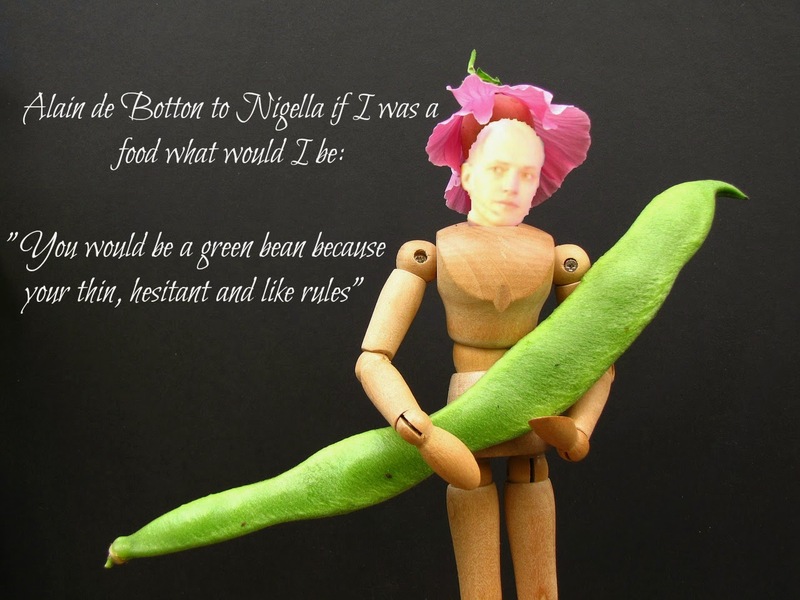 So when The School of Life were planning a talk all about food and the guest presenters were Nigella in conversation with Alain de Botten, well let's just say the tickets were booked in a number of seconds. Whilst I sat waiting in the audience I was busily planning my dinner for when the talk had finished. There was logic in me not eating beforehand. You see if someone talks about food the very mention of it makes me hungry, even if I have just eaten. So the master plan was not to eat and build up the perfect appetite. It worked a treat. I hadn't previously heard Alain talk before but he was a warm and funny conversationalist. He had his work cut out with Nigella who used her dry wit to have the audience laughing. Nigella also spoke about how we are fixated on recipes. The tyranny of the recipe is wrong it stops people being creative with food, adding ingredient’s they love for fear that the recipe will be ruined. Reading from her own cookbooks Nigella has arguments with herself. Following process and someone telling her what to do is annoying, even more so when you realise that the she is herself. 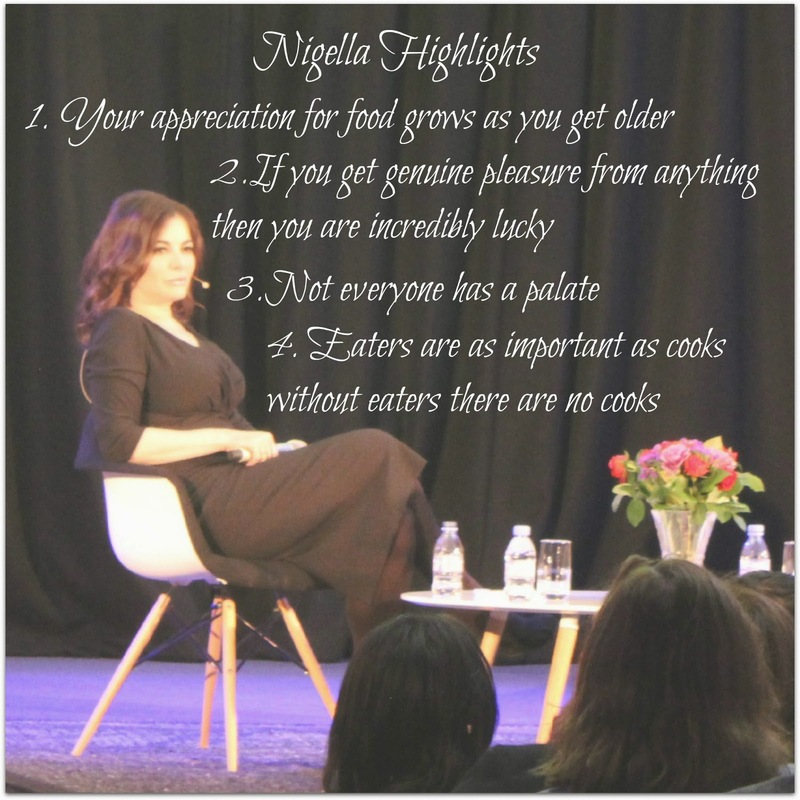 Nigella shared some interesting viewpoints and takes on food. I had a really wonderful night but the highlight for me has to be having my first ever signed cookbook and better than that in my blogging name. 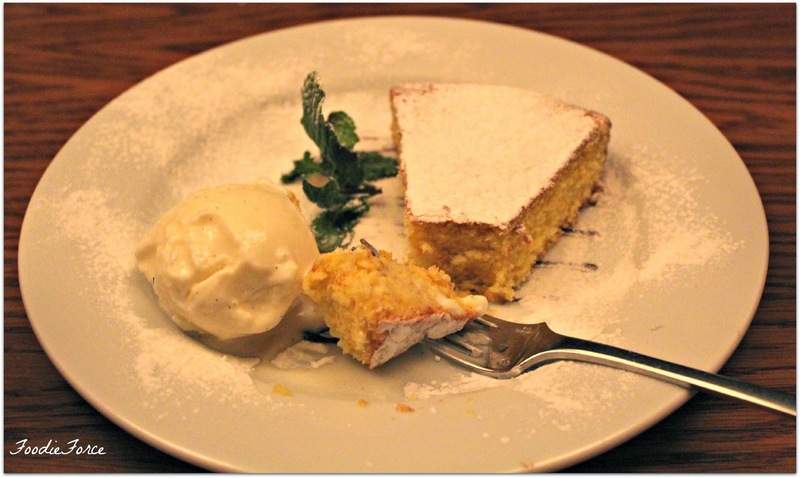 I was right that all the talking of food did make me rather hungry, so afterwards we ventured to one of my favourite Italian restaurants in London, Gustoso Ristorante & Enoteca. Visiting this restaurant is like eating in Italy the atmosphere is always warm and friendly and well the food speaks for itself. 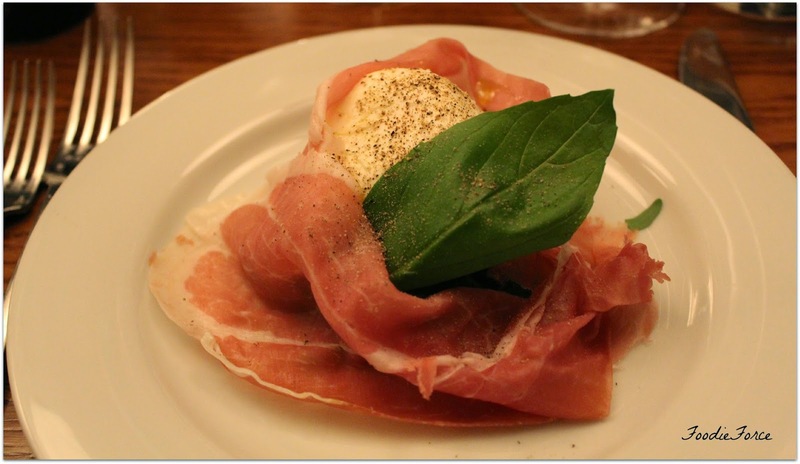 As a lover of Italian food, the starters and daily special menu always have an array of foods that I would happily eat, but I am drawn to my favourite Parma ham and buffalo mozzerella (£8.90). The other half opts for Seared scallops with celeriac puree (£9.50). There are no pretensions here, and the freshness of the food speaks for itself. The scallops are presented beautifully with the roe still attached and cooked to perfection. 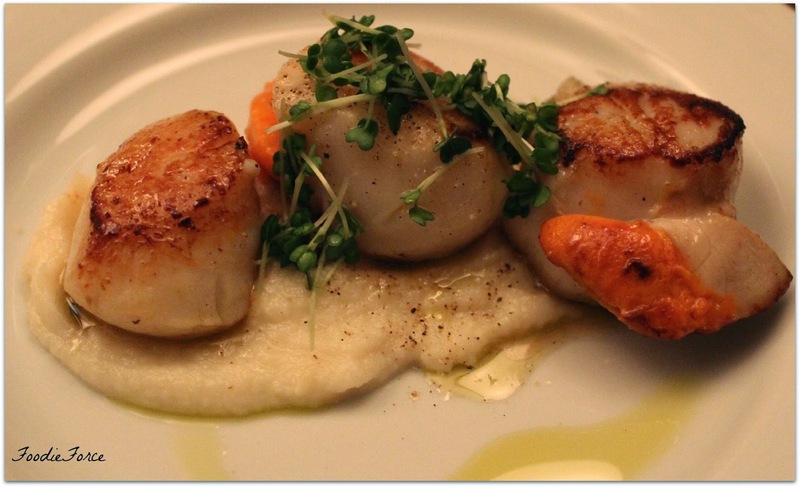 The seared scallops are wonderfully moist and the creamy celeriac puree has a beautiful flavour. For my main I decided to opt for something I haven't previously tried. 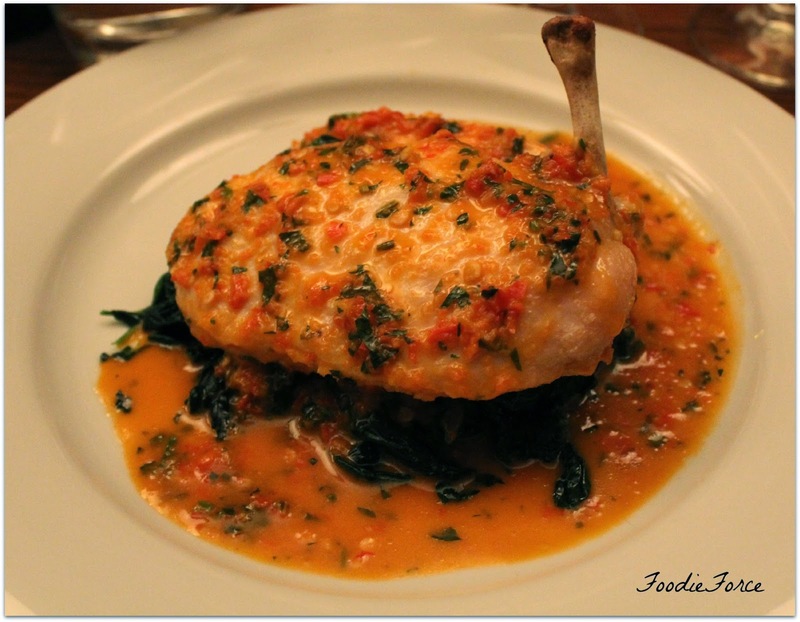 Roasted breast of chicken, garlic spinach and spicy “Diavola”sauce (£10). The Diavola sauce has a nice kick of chilli without being too spicy and the spinach is a nice accompaniment to the moist chicken. Now one thing that I love Gustoso Ristorante and Roberto especially is that he is a true Italian gentleman. My other half always loves ordering slightly off piste. 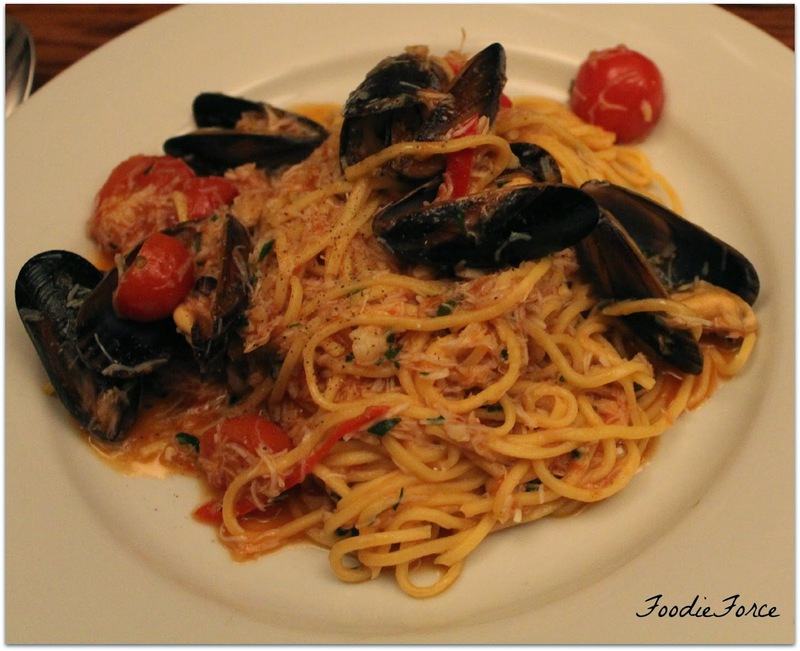 He opts for Homemade Tagliolini with crab meat, chili, garlic and cherry tomatoes (£13.50) but asks for the addition of mussles. Changing and adding an item is no big problem, this restaurant works on what a foodie wants and as the food is cooked fresh they can cater for variances. The dessert menu (£4.50 – £9.00) has many Italian delights, homemade Tiramisu (£5.50), vanilla ice cream with espresso (£5.00), selection of Italian cheeses (£9), and Viasanto with “Gustoso” biscuits (£8.95). Picking desserts is always a challenge as many of them I would like to try. 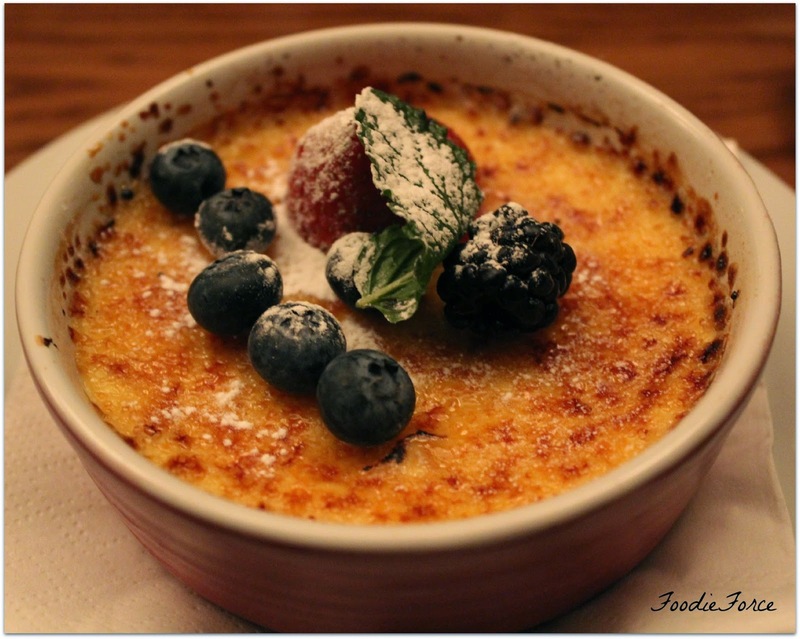 I love Crème Brule’ so I opt for this with mixed fresh berries (£5.50). The restaurant also offers specials and my dinning companion chooses carrot cake with vanilla ice cream. The cake was so good that I almost needed to wrestle the fork out of his mouth to get this picture. Gustoso offers a relaxed, unhurried dining experience, with high quality, tasty Italian food with friendly and attentive staff. It is my hidden gem in London and was the perfect way to complete a brilliant evening. Who is your favourite chef that you would like to spend an evening with? That's fantastic! It's so cool you got it signed in your blog name :))))))) You always go to the best foodie events. Oh what an amazing evening! The food looks delicious too, mozarella and ham is one of my favourites too, so I'm very jealous. I think I'd like to spend an evening with David Leibovitz, I know he isn't a full time chef any more, but his was one of the first blogs I ever read, years and years ago, and I'm still hooked today. I love the way he writes! This sounds incredible and so interesting! Nigella is great. I love watching her shows. She really has a passion for food and it shows. Seems like you had a delicious after lecture dinner. Oh wow! I'm a fan of Nigella! & the food looks amazing!!! I think this is my favorite post of your so far!!! I ADORE Nigella Lawson. I have watched all of her shows that are broadcast here in the US, including "The Taste". I have ALL of her cookbooks - they photos are so beautiful, and I actually enjoy reading her words. I love how at the end of the "Nigella Bites" shows, she would raid the fridge in her robe and just chow down.